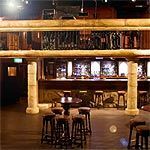 The Globe is a vibrant venue playing host to a varied programme of live music catering for all tastes. The Globe also offers a fully stocked bar and a selection of cocktails. Do you work at The Globe? What did you think of The Globe? Worst night off my life ! The bouncers were rude and had attitude and was very over priced to get in . Enjoyed an excellent eve at the new comedy night at the globe. nice relaxed atmosphere and some quality stand-up. One of the comedians is on Live at the Apollo in a few weeks (Sean Lock) but also good to see local comedy talent. looking forward to the next comedy events and within walking distance of home! Managed to catch Johnny Winter on the first night of his two dates at the Globe back at the end of May. Our first visit to the venue and it was great,staff friendly and helpful, love the Morrocan feel to the place plus the psychedelic posters that adorn the walls as you climb the stairs,nice touch. Upstairs is very hot(obviously heat rises!) but has a superb view of the stage with great sound,did get a bit full but then Johnny isn't in town every night! Below in the main area again its very full and still hot but what a great atmosphere. The stage is a great focal point for the venue,up close and personal as they say. Managed to get in front of Johnny and took some lovely pictures of him.He may seem frail and on the weak side but there's nothing wrong with his fingers,the man can sure play. No one left disappointed tonight. Icing on the cake was that we got to meet the man himself in his trailer after the gig,exchanged a few words and yes he did sign my now treasured Johnny Winter album! We will be back.I think its Walter Trout in October. A great venue - nice and wide, so you can get a good view of the stage. And they seemingly have some excellent music lined up - form both local bands and acts from further-flung places too. I can't wait to go again!